>Perhaps almost as well known as the Greek city-state of Sparta was their rival, Athens. And as Sparta’s rivals, their warriors were no slouches in battle, often wearing impressive helmets like the Athenian Hoplite Helmet into battle. 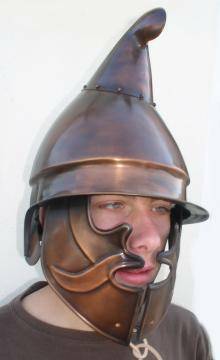 This helmet is patterned after the Phrygian style helmet worn mainly during the Hellenistic Period of Greek history. The helmet derives its name from its distinctive shape, which mimics the style of cap worn by the Phrygians of Asia Minor. 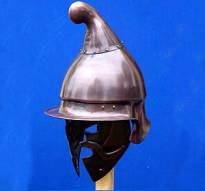 The helmet features a high, sloped top as well as a conical top with its tip tilted forward. The helmet continues down the back edge to offer limited protection to the nape of the neck, while the front features a brim that helps direct blows and other falling materials away from the warrior’s eyes. Cheek protectors are also featured on the helmet, to keep a warrior’s face safe, without compromising his vision or hearing. The helmet has the appearance of being made from smithed iron, with a dark brown bronzed finish. And not only was the Athenian Hoplite Helmet used and favored by Athenians during their battles, but it was also used throughout Greece, especially by the Macedonians. Wide-ranging in use, this helmet makes for a fantastic addition to any re-enactor’s equipment or a collector’s collection.